Breaking the Fourth Wall: Clever Gimmick or Slap in the Face? My love for slapstick comedy was evident at a very young age. Just ask my mom who used to film me ranting about airline food and had to clean up the aftermath of my Chevy Chase pratfalls. This is why I wanted to write a fangirl love letter to Twisted Pixel after recently playing Comic Jumper. The characters were outlandish, the voice acting was over-the-top, and the jokes were both clever and cornball. Yet, the comedic aspect that stood out the most was how they constantly reminded me that I was playing a video game – they didn't just break the "fourth wall," they crashed through it like the Kool-Aid Man. Editor's warning: Some older games will have their fourth-wall-breaking moments spoiled in this post. Naturally! The fourth wall concept originates from the theater, where a set is made up of three sides with an invisible fourth side separating the audience from the stage, allowing them to observe the action as an unseen onlooker. "Breaking the fourth wall," for example, would be one of the actors acknowledging that the audience exists, and thus reinforcing the fact that it's all just make believe. Many comedy-based games, including the Paper Mario series, Ratchet & Clank: Going Commando, Donkey Kong Country 2, No More Heroes, and, a prime example, Eat Lead: The Return of Matt Hazard, use this strategy to get a few laughs. Each features characters that become "self-aware," either referencing you (the player) directly or commenting that they are inside a video game. The Secret of Monkey Island frequently breaks the fourth wall, even joking at the end that the game probably wasn't worth what you paid for it. Games poking fun at themselves, by proudly proclaiming their fictional nature, is a gimmick that works well for these genres; it keeps things light-hearted and fun. However, this technique feels awkward when used in more serious games that involve life-or-death situations. It almost feels like a slap in the face. The Metal Gear Solid games feature serious plotlines, yet there are instances of fourth-wall breaking and "medium-aware" characters in almost every installment. 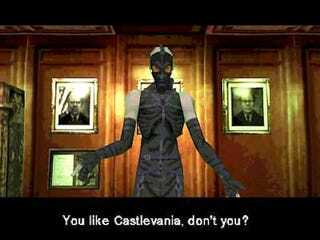 The most famous is the Psycho Mantis encounter in the first game, when he literally reads your memory card. While the bit is clever, it feels out of place, like it should have been an Easter Egg as opposed to an event in the game. Similarly, in MGS4, Otacon informs Snake at one point that he needs to switch to disc #2 – a direct reference to the first game. But, oh, right! He remembers they're now on a PS3, so a disc switch is no longer necessary. Sure, it's a cute moment of nostalgia – and perhaps a tongue-in-cheek slam at the 360 – but is this joke really worth the cost of jeopardizing the player's immersion? Max Payne is guilty of this gimmick, as well. During one of the nightmare levels, Max finds a note written by his deceased wife, which reads, "You are in a computer game, Max." The built-up suspense is now obliterated, as the gamer is removed from the story and remembers that, well, yeah, it is just a game. While there are pros and cons of breaking the fourth wall in the traditional sense, we must recognize that there is a non-traditional sense. This does not involve "breaking" the wall between player and game – it involves relocating the wall entirely. Evidence: The Last Ritual (2006) for PC directly acknowledges the player from the beginning, by sending emails to their personal email address and asking them to visit outside websites to further the narrative. Yet, the player is always referred to as a character, leaving no separation between player and game world. This is not breaking the fourth wall, but rather moving it behind the player to enhance the feeling of immersion. Other instances of "relocating the fourth wall" by forcing the player to utilize outside resources/hardware can be found in Star Tropics (NES), X-Men (Sega Genesis), and No More Heroes. Star Tropics was packaged with a mysterious letter, and, at one point in the game, you are told to literally dip that letter in water to reveal a code that would continue the story. In the X-Men level "Mojo's Crunch," players are forced to perform a soft reset on their consoles to "reboot" the in-game computer. And, of course, in No More Heroes, you find yourself holding the Wiimote up to your ear as a cell phone. Eternal Darkness: Sanity's Requiem is a perfect example of a game blurring the lines between digital world and real life in a fantastic way. It thrives on making the player question what is real and what is fake by deliberately causing game glitches and mimicking technical problems with your console and television. At one point, a "blue screen of death" even pops up, asking, "Do you wish to delete all save files?" with the only options being "Yes" and "Continue without saving." Like it or not, Eternal Darkness makes you part of the game. From a "wink" at the player, reminding them it's all just a game, to treating them like an actual participant, video games, as an interactive source of entertainment, have the unique ability to manipulate the fourth wall in ways other mediums can't. In order to recognize when and if it is appropriate to mess with this wall, we must first understand the difference between breaking it and relocating it entirely –- where the ultimate goal is always to enhance the gaming experience. Like any outside-the-box game mechanic, breaking the fourth wall should be used sparingly and with discretion. We wouldn't want our characters to start demanding to be let out of their shiny glass box, now would we?